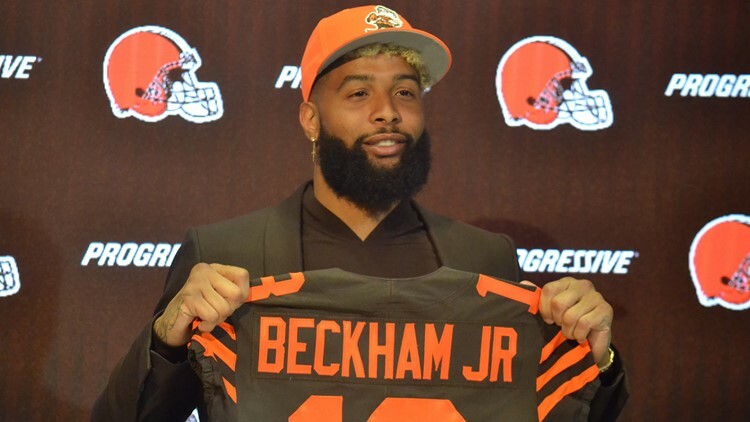 New wide receiver Odell Beckham Jr. ‘can feel the excitement’ of Cleveland Browns fans after the trade with the New York Giants. 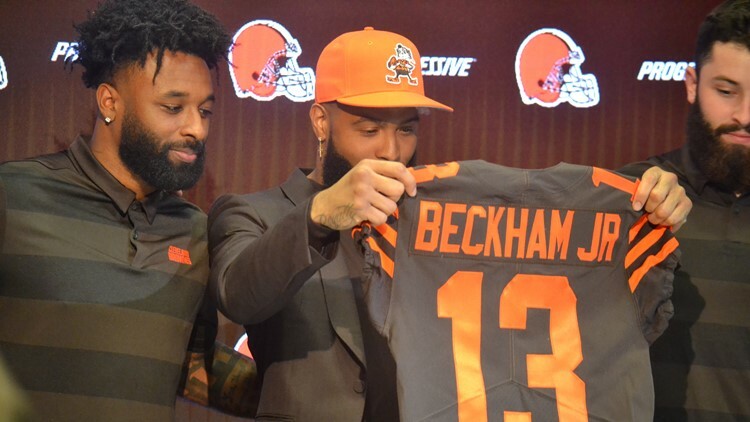 CLEVELAND — It did not take long for Cleveland Browns fans to embrace the idea of wide receiver Odell Beckham Jr. catching down-the-field passes from quarterback Baker Mayfield and alongside his college teammate, Jarvis Landry. With Mayfield emerging as a leader for the offense and Landry and Beckham Jr. combining their forces with the productivity of Nick Chubb carrying the ball out of the backfield, there is a palpable excitement level in Cleveland, and that was evident to the newest member of the Browns. “I can feel the excitement,” Beckham Jr. said during his introductory press conference Monday. “To be a part of that, it is exciting for me. Fans have come up with some creative ways of showing their excitement since Beckham Jr.’s arrival in a trade from the New York Giants on the first day of the new league year: March 13. Along with “Avengers”-themed trailers, a Disney movie parody emerged in the days following the trade. Several local fans combined their talents to write, produce and edit a parody video of the song, “A Whole New World” from the Disney animated film, “Aladdin.” Entitled “A Whole New Land,” the video has actors portraying Mayfield and Beckham Jr. on a magic carpet ride through Cleveland. Longtime friends Jarvis Landry (left) and Odell Beckham Jr. (right) are teammates once again, this time with the Cleveland Browns. The video begins with Mayfield extending a helping hand to Beckham Jr., and then, the two shared a magic carpet ride around the city of Cleveland. “I can show you The Land, cloudy, cold, but friendly,” sung the actor portraying Mayfield. “Tell me Odell, now when did you last let your heart decide. You can silence the crowd from drafting blunder by blunder, over The Shoreway and under on a Cleveland carpet ride. “Something that I told O was that the love and the appreciation of everybody that works in this building, from top to bottom, is something that made me feel so comfortable -- the way that it feels like family here,” Landry said.